I am still making trips to the orchards. One of my favourite local ones is Terry's Cherries (yes he really is called Terry.... much to the amusement of my 7 year old). I love his orchard because it is truly traditional. Beautiful standard sized trees out in the countryside, laden with succulent cherries, harvested using long cherry picking ladders and sold out of a hut using traditional weighing scales. To get there you have to follow signs from a back lane and drive down grassy tracks through the apple and pear orchards until you see Terry's shack propping up a sign which requests that you 'Sound Horn for Service'. It is just so perfectly cool in this crazy modern world to find a remnant of 50's England tucked away and hidden, determinedly unchanged and still 'making it'. But it would appear I am not the only one who knows about Terry's Cherries............. Turns out a reporter from the Telegraph did a feature on him last year! Oh, and in case it wasn't obvious, the cherries (of which he grows several varieties) are big and beautiful................ fresh, juicy, sweet, and a delight to eat. Cherry season couldn't be allowed to pass without an experimental session with the ice cream maker. I cannot believe how much ice cream we are getting through since we got it. It's a good job me and my husband do the 5 2 Fast programme or we'd be really over-weight by now! This time I thought I 'd try a recipe that incorporated Mascarpone, as I adore its rich creaminess and think it adds a certain decadence wherever it is used. Having managed to find a handful of ice cream recipes on my shelves which used Mascarpone in the mix (some with raw egg and some without), none of them sounded quite right for what I wanted to achieve. So I decided to go it alone and try developing a no egg base which seems to bear no relation to any of the recipes that I looked at. A few days ago I made some candied cherries using a recipe (slightly amended) that I found in The Perfect Scoop (David Lebovitz (2007)), and decided to swirl these into the ice cream base along with some dark chocolate chips and shavings. Cherry and dark chocolate are always a good marriage and in this ice cream they blend beautifully with the creaminess of the Mascarpone. Eat it on its own or snazz it up into a wonderful sundae with some left over meringue and cherry sauce..................... When I heard my daughter shout 'Mum.................. this ice cream is to die for.......' I knew I had surpassed my expectations and achieved a decent result. Put all the ingredients (except the almond) into a large saucepan and heat until boiling. Turn down the heat to a gentle boil and leave to cook for about 30 minutes, stirring occasionally. Continue to gently boil until the liquid has reduced to a light syrup. You will want to check and stir more frequently towards the end of the process to make sure that the cherries do not become too sticky. Once happy with the consistency, turn off the heat and stir in the almond extract. Leave the cherries to cool either in the pan, or pour into sterilised jars for storage in the fridge. Put the Mascarpone, cream, milk, sugar and vanilla into a blender and mix until well-combined and smooth. Chill in the fridge for an hour or two before pouring into an ice cream maker. Churn according to the manufacturers instructions. When the ice cream is almost done, add the chocolate into the ice cream maker and continue to churn to complete the freezing process. The chocolate should now be evenly distributed in the ice cream. Once the process is complete, remove the paddle from the ice cream maker and add a few spoons of candied cherries. 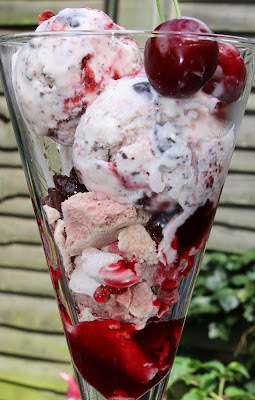 Gently fold into the ice cream, being careful not to over-mix, so that the ice cream still has a swirled appearance of cherry against pale cream. Spoon into a freezer container to store and place in the freezer to harden fully. Once frozen, eat as it is or decorate and serve as a sundae.